“Photo Of The Day” Contest 2017 has already started for 5th year. Capture your memorable holiday experiences through camera clicks. 3rd step: Stay Tuned to see the results at our Photo of the Day page! 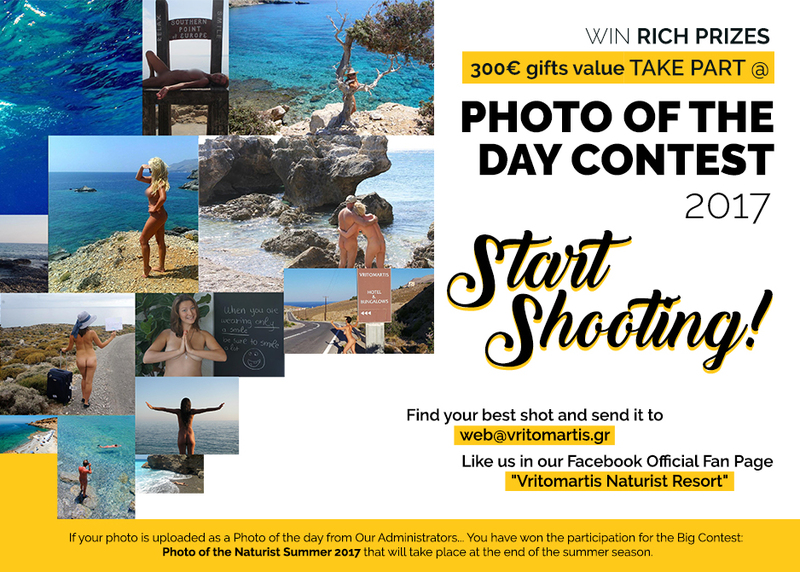 If your photo is uploaded as Photo of the Day from Our Administrators… You have won the participation for the Big Contest: Photo of the Naturist Summer 2017 that will take place at the end of the summer. 300 Euro Value Gifts to the Winner. So…are you ready to take photos? The weather is perfect, the scenery is magical and you are on holidays. We’re waiting for your funny, artistic, family, one-person, spontaneous pictures in our beautiful Crete. This entry was posted in Vritomartis News by Vritomartis. Bookmark the permalink. Hope you get some great responses.! !